Fathom Events, TCM and Columbia Pictures present Lawrence of Arabia, in select cinemas nationwide for a special two-day event featuring exclusive insight from Turner Classic Movies. 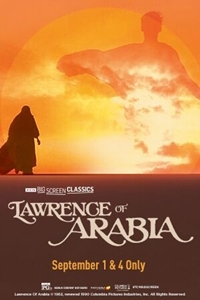 Winner of 7 Academy Awards® including Best Picture of 1962, Lawrence of Arabia stands as one of the most timeless and essential motion picture masterpieces. The greatest achievement of its legendary, Oscar®-winning director, David Lean (1962, Lawrence of Arabia: 1957 The Bridge on the River Kwai), the film stars Peter O'Toole - in his career-making performance - as T.E. Lawrence, who heroically united rival Arab desert tribes and led them to war against the mighty Turkish Empire.